When it comes to safely transporting the children of North America, there is nothing safer than a school bus. According to SchoolBusFacts.com, students are 70 times more likely to get to school safely if they ride the school bus, instead of traveling by car. And manufacturers like Blue Bird are going well above the standard when it comes to school buses. Beginning in 2019, Blue Bird’s buses will come standard with electronic stability control (ESC) and backup camera systems. The school bus manufacturer has offered ESC to customers since 2015—a first for the industry at the time and three years before any other school bus manufacturer. In larger medium- and heavy-duty truck applications, ESC serves as a way to prevent rollovers. 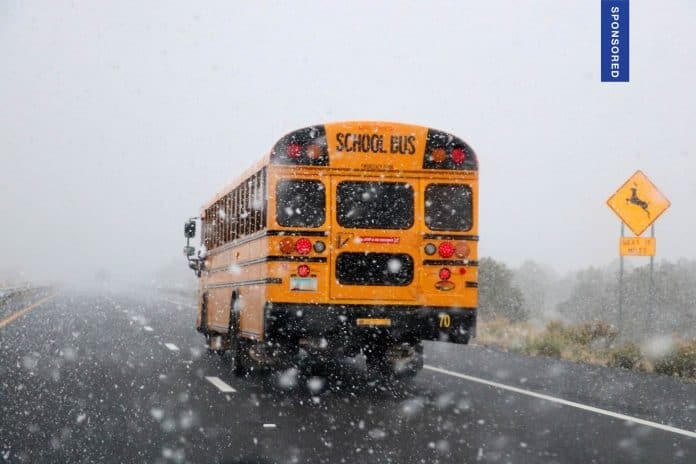 It also works to prevent incidents in unpredictable road conditions, such as ice, wetness, sand and mud—all conditions a school bus driver may encounter. A group of sensors “notifies” the ESC system when a potential situation may occur. It then activates the brakes in a sequence, to reduce the chance of a potential accident. While ESC enhances safety, it does not take responsibility away from the driver. Rather, the system acts as a way to give the driver better control in situations where slides and skids may occur. Blue Bird offers ESC on its propane, gasoline and diesel buses that are equipped with air brakes. The ESC system is offered by Bendix, a tier 1 supplier that specializes in brakes and braking systems. Blue Bird is a safety step ahead with another feature, too. Rear backup cameras now come standard on all Blue Bird school buses. This system uses a single camera located at the back of the vehicle. The camera shows a 150-degree field of vision image of the rear of the bus through a 7-inch LCD color monitor that is displayed in the rearview mirror. It shows an image only when the bus is in reverse, and features night vision capability—all to help drivers confidently operate their school buses. The modern driver is used to having systems like electronic stability control and rear backup cameras on their personal vehicles. For new school bus drivers, the addition of these standard features is a welcome element to encourage participation in this crucial endeavor. Blue Bird consistently innovates to tailor its buses to give drivers confidence while on the road. These new standard safety features make the bus more comfortable to operate, while keeping children safe. Safety for students, peace-of-mind for drivers. That’s been Blue Bird’s goal for more than 90 years. So, whether you’re considering a Blue Bird propane, gasoline or diesel bus—you’ll now have electronic stability control and backup camera systems as standard equipment. For more information, contact your local Blue Bird dealer, or visit www.blue-bird.com.